We have had a blast this past weekend in Meridian, Mississippi. We've had quite a few laughs along the way and it's so fun to road trip with the family! We borrowed my mom's mini-van (that we will buy in the next 6 months) and it was SO great traveling in such a huge vehicle! Luke LOVED sitting in the back seat. 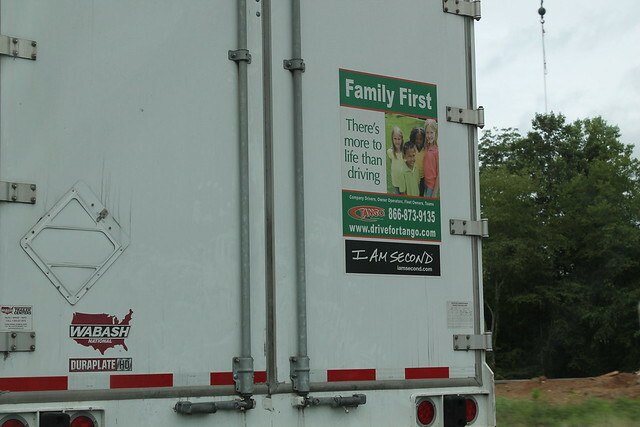 On the trip to Meridian we passed this truck- we really like the I am second website! and then we got stuck in terrible traffic. Of course the second we got stuck in the traffic Emberly woke up screaming and Luke had to potty. Again, I was SO thankful to have so much room to help Luke properly relieve himself (in a Cherry Coke can)! Emberly got to meet her Grampa for the first time! He also started her Barbie collection on this trip :) He's the man behind Luke's train collection! We had a few rough sleeping nights at Grampa's house. But isn't that face SO sweet?? Saturday morning we checked the weather and saw that it was suppose to rain most of the day so we packed up that morning and headed to the playground. Upon arriving Luke declared "This is the biggest playground I've ever seen!" Also while walking across the "shake shake" bridge he said "This place is SO awesome!" Luke, Daddy and Grampa went to ToysRUs (actually it's called Geoffrey's here) and Grampa picked up some more train stuff. Luke was in heaven. He added to his collection, Diesel 10, Rocky, and Gordon. He also got the water tower to add to his table at home! While the boys and Emberly were there, mommy got a shopping afternoon! I blogged about Treasure Hunt last year, and I went back (it's called Dirt Cheap in Meridian)! Ohhhh my I remember why I love that place so much. Here's a sneak peek, and my experience deserves its own post! Sunday we worshipped at Fellowship Baptist and hung out with our friend Jace! Josh was in Corey & Kim's wedding and Corey was Josh's best man at our wedding. Hard to believe our babies are now playing together! We got back to Grampa's and he had set up a real train set. Luke loved being the controller and blowing the whistle. It was fun! As this post is published we will be on our way to Arkansas to visit Nana, G-pa and the aunties! Luke can't wait!